A Kirklees apprentice is encouraging other young women to consider a career in engineering – as figures show that just 3% of those starting engineering apprenticeships in the UK over the past two years have been female. Megan Lunn, of Meltham, is in the third year of an apprenticeship with global engineering firm Reliance Precision Limited. She is working towards an Advanced Modern Apprenticeship in mechanical engineering – spending one day in the classroom at Kirklees College and the rest of the week at the company’s Lepton headquarters. Since September, 2011 – when Megan started with Reliance – some 23,510 men have started engineering apprenticeships compared to just 760 women. Kirklees is now aiming to increase the opportunities available for young people and businesses through apprenticeships and is one of eight apprenticeship hubs in the Leeds City Region. A Business Brokers scheme has been set up to provide firms across all sectors with the advice needed to identify where roles can be created and what financial support is available. 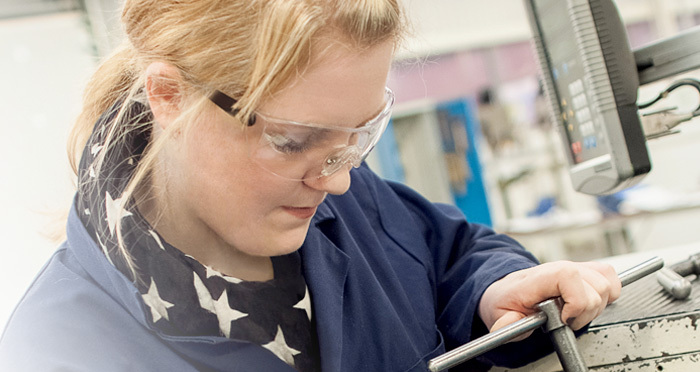 A key sector being supported is engineering – building on the district’s industrial heritage – and Megan says her teacher at Honley High School gave her the idea of an apprenticeship. “I was really interested in science and technology at school, but wanted to use that practically rather than continuing to just study for years,” she said. A government report, Tomorrow’s Engineers, found the UK has the lowest percentage of female engineering professionals in Europe. Megan says this spurred her on, adding: “For me, often being the only female has not been a problem and no-one has ever treated me any differently. Grants of up to £1,500 are available to fund new apprenticeships in businesses of up to 1,000 employees which have not taken on an apprentice in the past year and Kirklees Business Brokers are able to help companies explore the best option for them and unlock that funding. Kirklees Council leader Clr Mehboob Khan said: “Kirklees has a strong heritage of engineering and Megan’s story shows the importance of apprenticeships to ensuring our area continues to be a world leader in the industry. He said: “With so few females in this country choosing engineering as a career option, it is encouraging to see that companies like Reliance Precision are helping buck that trend here in Kirklees. Article supplied courtesy of Kirklees Council.